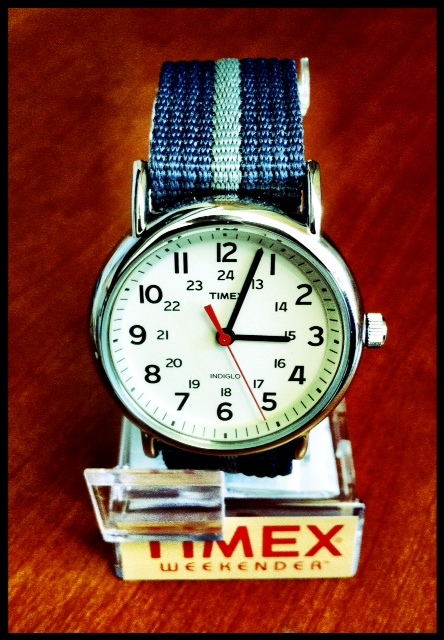 after i posted about the new timex weekender watches on tuesday, i ordered one. it arrived yesterday. i love it. it’s hard to believe i thought about dropping $150 on one of those timex for j. crew watches when this puppy only cost 40 bones and shipped for free. having seen the timex for j. crew watch in person, i prefer the look of the weekender to that one. it also has indiglo which made the 12 year old in me very excited. i can’t wait to show it off the next time i go to the movies. i’m kidding, but i figured i’d needed to share a quick pic before i put it on my wrist for the rest of the summer. you can get your own timex weekender here. Saw this at a City Sports last weekend and resisted the urge to pick one up. Great watch, though. If it had a date function I would have bought two. Thanks for the tip. I just bought 2 of these, one for me and one for my brother as a gift. In the picture the color looks Blue/Blue is that the Blue/Grey version (T2N654)? I have the Grey/Orange which I love but haven’t been able to find that band combination on their website. Thanks! Thanks for the great find! Bought it…love it! Simply super value! Quick question. Does this watch have a stainless steel case or does it appear to have some kind of finish on it. I have an allergy to metal finishes. Thanks so much!! stainless steel back. polished brass case. yes, you can put any band you want with the watch as long as it fits. great watch. timex are over-rated. The watch snobs at http://www.thenewspeakeasy.com have no idea how cool that piece is. I’m looking at the olive one, what kind of clothes can you pair this up with? are the straps adjustable ?